We’ve already looked at a couple of types of variable resistor - the force sensitive resistor and the photocell. Here we’re using manual input to adjust the resistance of the component. A potentiometer is essentially a dimmer switch. As you dial it down, it becomes more resistive, allowing less electricity to flow. When you dial it up, it becomes less resistive. Inside the potentiometer, there’s a slider. This is what our analogPin is connected to and reading from. The slider moves along a circular track, and the track acts as a resistor. Turning the knob, moves the slider around the track. As it moves along, this track it increases or decreases the resistance and we can use this to determine the relative position of the slider. 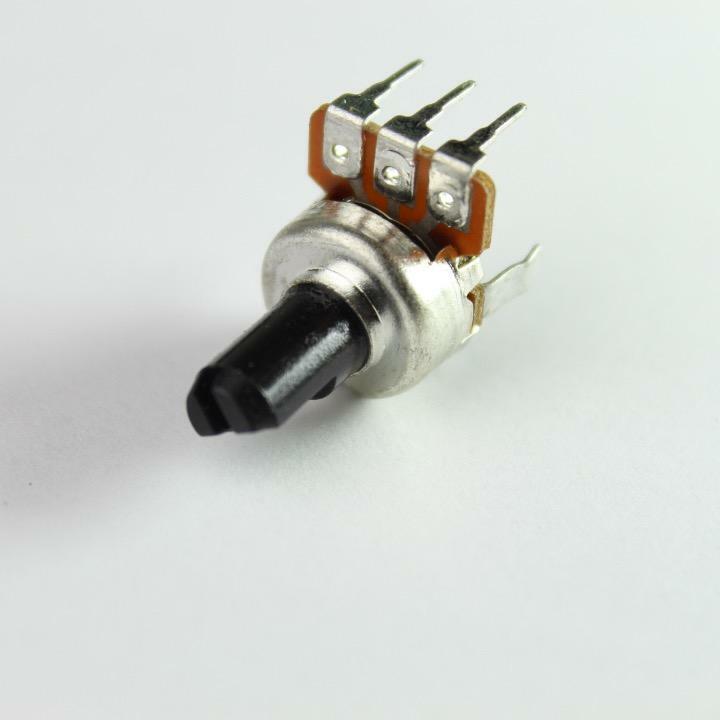 Potentiometers don’t have to be circular. ‘Sliders’ which move along a track on a horizontal axis work with exactly the same principle and this guide works just the same for both components. This is the potentiometer. It can be a little awkward to fit into a breadboard, so consider soldering new connections to the pins (don’t forget to color code). It has three pins. The outer two pins work much like any resistor - they can be connected in either direction and to either Ground or Power. The middle terminal is connected to the slider (or the bit that moves) allowing us to read it’s “position”. When wiring a potentiometer, wire either left or the right terminal to ground; the remaining outer terminal to power (3v3) and the middle terminal to an analog pin you want to read from. We’re going to wire up a pot. and allow you to fade up and down an LED as you turn the dial. Our code is identical to the FSR - it’s another component that gives us a ranged set of analog readings / values! Compile and rotate that dial! Practice makes perfect… so try this out! Combine a switch (or button) and potentiometer. The switch should turn on and off the light while the potentiometer will fade up and down the light (but only when its on).